After our clients have purchased their properties, the most popular request is the management of their new home. We want to fulfill your property needs. That is how Watabe & Company began and we were the first “Independent Second House Management Company” in Japan. We provide the support you require as well as catering services etc… during your stay at your second home to make it as comfortable as possible. We can also look after your home while you are away. If you have any problems or queries, please ask us at first! Our aim is that we can offer you the best service, just like a hotel concierge at your second home. For your peace of mind, we can promise you a first class second home management service. Please feel free to ask our designated front desk anything related to staying in Karuizawa. We will take your requests at our designated front desk. Please feel free to contact us on the phone or via E-mail. Delivering the local Newspaper in Karuizawa, which is issued each month, according to your length of stay. It is useful for checking local information about events in Karuizawa. (*) Please let us know as soon as possible if you would like to cancel or change it. You may be charged if you fail to inform us that you wish your newspapers to be cancelled. We want you to have a pleasant and relaxing time in Karuizawa; therefore we will provide you several services during your stay. Please tell us which items you will need beforehand. We will need the date, the time and location for the delivery. Food is among the items that we can deliver. We can prepare and deliver, to the house where you are staying, the supplies you might need for your party, barbecue etc. We can visit you to make the necessary arrangements beforehand. For instance we can offer you suggestions, depending on the type of party, number of guests and the specific requirements you might have. You will have to confirm the type of supplies you will require by showing you pictures and samples. We can deliver the supplies on the day you need them. After the party you will not have to clean them, we can collect them as they are. If you request it, we can setup your party and take care of the cleanup afterwards. We will visit you to make the necessary arrangements and confirm the venue. We can prepare the tables, chairs etc. We also provide a rental service for table cloths and glasses. 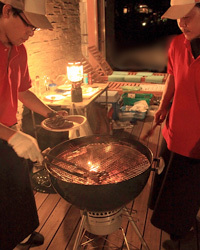 We can also prepare your barbecue and clean up for you once the event is over. In order to provide you this service we will need certain information, such as the BBQ’s date, the number of guests, your budget, etc. We will provide you the appliances and food your BBQ will require. If you request it, we can setup the tents, tables, beer keg, etc. Our employees can also help you lighting a fire. Additionally, we can prepare and serve the food. You will not have to worry about the cleanup, we will take care of it. ※We can also prepare side menus at your request. You can choose between Japanese food, American food, Italian or French food. Our chefs will visit you, prepare and serve the meal for you. You will enjoy fresh food, cooked by a professional. We will need to know the date the type of event, the number of guests, your budget, etc. We can put you in contact with our associated restaurant, which is our company’s partner. If you request it, you can meet the chef and discuss your food preferences. On the day of the event, our chef will visit you and prepare the meal for you. Afterwards, we will take care of the cleanup. We will provide you an estimate of the costs. 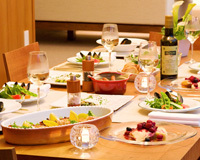 The delivery of meals cooked by some of Karuizawa’s finest restaurants is also available. If you wish to make use of this service, please provide us the date and time of the delivery, the number of people and your budget. You can choose from several menus such as hors d’oeuvre, bento, etc. You can specify the time at which the food should be delivered (same here, you just said it before). ※You can make use of this service for birthdays, parties and any other occasion. We can provide futons, deliver them, collect them or dry them in the Sun. This service is very useful when you have unexpected visitors. You will have to specify the room and the date for which you need bedding. Another service we provide is bed making. We can collect the bedding after its use. Duvets, futons, pillows, sets of sheets, duvet covers, mattress covers, blankets, mattresses, and pillow covers. we can also let bath towels, face towels, yukatas, etc. We choose ourselves, process and dry firewood, which you can use in the fireplace or wood-burning stoves. We can deliver the firewood to the place you specify. We can also chop the firewood for you. We also offer the service of cleaning and the housework while you stay at the villa. We can vacuum every corner of each room, from top to bottom. 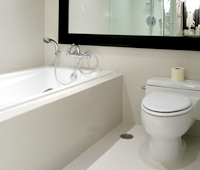 If requested, we will clean toilets, sinks, bathrooms, kitchens, etc. We can also clean crockery and cutlery. We can collect all your rubbish. Please contact us as early as possible, as we might not be able to provide this service if we are fully booked. As Karuizawa is located at an altitude of around 1,000 meters, it snows between December and March every year. We can clear the snow upon request, so that you can stay comfortably and safely while you enjoy the winter. With a snowplow, we can clear the snow from the street until the entrance of the garage and or the door step. We can also clear snow from wooden decks, roofs, etc. We can, as well, clear away dangerous icicles. We will offer a quick response if it snows unexpectedly during your stay. We would love to help you with various ways for you to have an enriched time in Karuizawa. We can prepare the indoors and the outdoors of you second home, so that you have an enjoyable time from the moment you arrive at your second home. We also check the locks, doors/windows and clear up your second home when you leave. ※We accept Takkyubin (goods sent through the home delivery service) free of charge as long as it is possible to deliver items when you check in and to collect and send parcels when you check out. ※Please send us your parcels two days before you check in if you would like us to deliver to your second home on time. Collecting of household waste・Checking and making sure that the fire is out・Shutting Shutters・Checking locks・Collecting parcels and sending them through Takkyubin (goods sent through the home delivery service). We take used linen and clothes to the dry cleaning service or wash them. ※Please ask us about it when you check-in, check-out and use house cleaning service. We collect the used linens and clothes. After clearing the washing lines and clothes, we bring them in to your home before your arrival. We also collect the linens during your stay upon your request. We can do the bed making using our own professionals. You will enjoy sleeping on our neatly prepared beds. We can prepare all beds and Japanese futons. Please request the number of beds, number of people and the rooms to be used etc. Please contact us over the phone when you would like to get rid of the bulky rubbish your home. We will visit you, then remove these items for you. Please let us know about the amount of rubbish/waste such as numbers, size and type etc. The staff from our company visit you at home and carry the rubbish out and dispose of it for you. We can get rid of vast amounts of rubbish/waste after a party etc. ※Please note that there will be an extra cost to get rid of electrical appliances, waste tires, cars etc. We can receive your parcels and deliver them to you on your arrival. We can send your parcels for you too. You can send parcels, which you would like to have at your home, to our company address. We will deliver them to your second home either on your arrival date or your requested date. We will open the parcels, assemble, install and take away the packing materials as per your instructions. We can keep fresh food and cold things in the refrigerator. ※Please make sure to write the sender’s name clearly. ※Please send fresh food, cold things and frozen food by a refrigerated courier service. ※Please send the items the day before your arrival at your second home. ※Please consult with us about any large/bulky items. If you forget something or need items suddenly in your second home, we will go to collect them for you. We will send them to the address of your request. We can maintain your cars for you at your second home. ※We do a prestart inspection once or twice per month to prevent any problems before you use it/them. We carry out the prestart inspection once or twice per month, regularly checking up of your second home or on your check-in day. We can also carry out the vehicle inspections for you. We can do all the paperwork and complete the vehicle inspections etc. ※If there are any troubles or the car needs to be repaired, we will inform you as soon as possible. We can wash curtains and carpets. We will visit you to check the materials and sizes etc. of the curtains and carpets beforehand. We check the condition (i.e. dirt and stains) first and then depending on the material and type of stain we use a special cleaning solvent to remove the dirt. We will put them back to their original place after the cleaning. We will wash and dry futons. ※As Karuizawa gets very humid, we recommend to use this service once or twice per year. One of our experienced staff will visit you to collect the futons. We will check with the work place and the numbers of futons beforehand. We will visit the work place futon dryer by car and work at the arranged work site. ※It takes about one month so please contact us as soon as possible. We will act as administrators and manage your home efficiently. Procedure to obtain the number for your second home etc. The piano tuner who is in charge of Ooga Hall in Karuizawa will tune your piano. ※Please let us know the type of piano, how often you use it, how often the piano is tuned etc. beforehand. He has trained at Steinway Co. in Germany and Fazioli Co. in Italy and gained a world recognized level of piano tuning skills. He is in charge of Karuizawa Ooga Hall and other concert halls in Nagano. 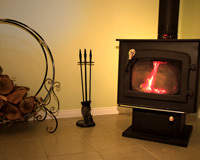 We sell the firewood, which we choose, process and dry, for the fireplace and wood-burning stove. We can deliver the wood to the place you request at your home. We can chop firewood for you. Our expert staff can clean the inside of your home to make sure that you have an enjoyable time during your stay. We also provide this service for any specific place you would like us to clean. We clean living rooms, children’s rooms, bed rooms, guest rooms etc. thoroughly. Opening of Windows and ventilating the rooms. Collection of rubbish from each room. Removing of cobwebs and dust. Removing of the dead carcasses of [Kamadouma = Camelback Cricket] which is very common in Karuizawa. Checking of the humidifiers and dehumidifiers. Making beds upon your request. We can clean and polish the bathroom. – Removing mold, watermarks, scale, gunk etc. Cleaning of the bathtub, floors, walls, shower room and windows etc. Cleaning, wiping and polishing taps and showerheads. Removing sliminess and dirt from any bath amenities. Removing rubbish and sliminess from the drain. Wiping and polishing of the lighting. Wiping to remove any remaining water from the whole of the bathroom making sure not to leave any watermarks. We clean and polish the washroom area including mirrors. – Removing mold and watermarks. Polishing the mirrors with a special detergent. Cleaning and polishing of the taps and sinks. Cleaning and wiping up the sink area. 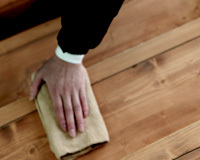 Removing dust and polishing furniture. Vacuuming, wiping up anywhere with a damp or dry cloth. Wiping the surface of washing machine with a damp cloth and remove the dirt and dust. Tidying up of any amenity goods and collection rubbish from the bin. Cleaning and polishing of the mirrors with a special detergent. Cleaning and polishing of the toilet tank and taps. Cleaning the toilet seat and inside of toilet with a detergent and polishing too. Wiping the display cabinet etc. with a damp or dry cloth. Vacuuming the floor and wiping with a damp or dry cloth. Tiding up the toilet accessories and collecting of rubbish from dust box/bin. ※Depending on the type of dirt it is possible that we may be unable to remove it completely. We clean and remove burn marks from the hobs, watermarks from the sink and taps, oil stains from the walls and dirt from the whole kitchen. We finish off by polishing everything. Washing up the used tableware and then put them back to their original place. Cleaning the inside of the drains. Washing and wiping up the inside of sink. Removing dirt and wiping up the kitchen counter. Removing the burns and oil marks from the hobs and washing them with detergent. Vacuuming the kitchen floor and then wiping with a damp of dry cloth. Wiping up the whole kitchen and polishing the taps as well. ※Please note that depending on the type of dirt it might not come off completely. We can clean the extractor hoods for the kitchen. ※It would be more effective with regular maintenance. Dismantling the extractor hoods and washing them thoroughly. Removing the stubborn oil dirt and dust with a special detergent. ※We can clean other types of extractor fan. (other than kitchen ones). Cleaning and checking the inside of refrigerator in order to keep it clean. Disposing the leftover food from the refrigerator upon your instruction. Removing the dirt from the inside of refrigerator. Sterilizing the inside of the refrigerator with alcohol. Removing the dirt from finger marks left on the refrigerator and then wiping and polishing it up. Removing and preventing the water marks from the kitchen, bathroom and sink areas. Removing of the stubborn scale (You cannot always remove them with regular cleaning.) with a special detergent. Reviving the sink and bathroom taps to almost new. ※Depending on the type of materials, we are sorry but we cannot always clean as well as we would like. We can use a special coating to prevent water marks/scale from the mirror and widows in the bathroom and sauna room from developing. ※We recommend to use this coating once a year. Removing dirt from all windows, window frames and screens/nets in the house and polishing them up. Cleaning dirt from each room`s windows and window frames using a special detergent and tools. Removing dirt from the window screen using a special brush. Wiping and Polishing them without leaving any water drops or marks. ※It is possible to clean the clerestory windows. Cleaning the fireplace and wood-burning stove. Removing resin and soot on the windows. ※it will last longer with the regular maintenance. Removing the soot left in the fireplace and wood-burning stove. Removing resin and soot using a special detergent from the inside of the windows. ※To clean and check the chimney regularly improves thermal efficiency. ※Doing this will help prevent a chimney fire. ※We recommend that the chimney be checked once a year and the chimney cleaning done every other year. We will visit your home beforehand and check the type of chimney and the shape of roof. Checking the condition in case of dirt as well as if there are any bird nests and damage. Reporting the result of the check-up. Removing soot from inside of the chimney with special tools without scattering dirt. Checking the consumable supplies of the fireplace and the wood-burning stove. Giving you advice on how to use it and how to maintain it. Reporting the before and after work. We do basic cleaning of the inside of building. ※We recommend to use this service before and after a home party and before a] long stay. Vacuum cleaning, wiping with a damp or dry cloth and wiping/polishing up thoroughly in each room. Collecting of rubbish from the dust box/bin. Checking inside of the rooms. Removing dust from furniture and lighting etc. Cleaning toilets, sink areas, bathrooms, kitchens, extractor hoods and inside of the refrigerator. Special cleaning for the water prone/wet areas. ※We recommend to do this once or twice a year. Vacuum cleaning, wiping with a damp or a dry cloth and wiping/polish up thoroughly each room (every corner of the room). Removing of dust and polishing the furniture and lighting. Removing dirt from windows and window screens. 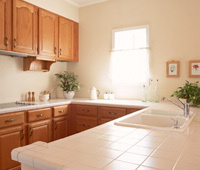 Cleaning the toilets, sink areas, bathrooms, kitchen, extractor hoods and inside of refrigerator. Cleaning of the fireplace and the wood-burning stove. Although Karuizawa has a rich nature, it can be troublesome for second home owners. 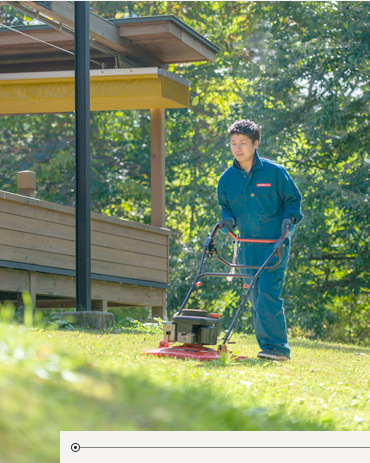 Our staff, who have a good knowledge of all four seasons and the natural environment in Karuizawa, can make the outside of building and garden area neat and tidy. We can remove weeds etc. in the garden. We will visit your garden to check the size and shape, and then do the work. We use a chip saw and chain saw for the plants that need to be cut down etc. Although it is enjoyable to see the changing leaves, fallen leaves are troublesome to home owners. We clear fallen leaves and make your garden, around the building etc. look clean and tidy. We will report to you with before and after photos. We help to maintain and keep your lawn looking beautiful and healthy. We use a professional lawn mower and remove weeds etc. We recommend regular maintenance. We will report to you with before and after photos. If you have any concerns regarding the lawn condition etc. As Karuizawa is located at an altitude of around 1,000 meters, it snows between December and March every year. We can clear the snow upon your request so that you can stay comfortably and safely as well as enjoy the snow season. We can clear snow from the entrance to the door step and car park etc. We use a snowplow. We can clear snow from wooden decks, roof etc. as well as clearing away the dangerous icicles. We can respond quickly when it snows suddenly during your stay. Removing fallen leaves and moss etc. from the roof. We recommend cleaning your roof regularly to avoid leaks. We will send you a report with before and after photos. ※Depending on the type and slope of roof we might not be able to do fulfill your request. Removing fallen leaves and mud in the gutters. This improves drainage. We also check if there are any damages. We will send you a report with before and after photos. ※Depending on the type and slope of roof we might not be to fulfill your request. We can remove dirt and moss from the deck and then we wash it. We also check the condition of the paint and also check if there is any damage or not. We will send you a report with before and after photos. Cleaning of the outside lighting to maintain a good level of brightness. Checking the bulbs and changing them if they need to be changed. We can cut, replant and transplant trees/plants the way you wish in your garden. We can manage a wide range of issues regarding plans. We can visit your second home, check the size and condition of trees which you would like us to cut or replant and then decide the date we will work on. We can do gardening and planting suited to Karuizawa’s climate. We will visit your second home and check the garden area. We will ask obtain your requests and budget and then suggest the contents of your garden. We will purchase nursery plants, plant them, make a flower bed etc. as per your instructions. During your absence we can water the garden regularly. We can illuminate lights in the garden during special event seasons such as Christmas as well as party as per your request. We will check the area, trees and wiring etc. We can suggest the decorations depending on your budget and requests. We will prepare all the materials. We can complete the decoration on the date you request. After the event we will remove them as per your instructions. We will check inside and outside of your second home regularly during your absence, so that you can stay comfortably when you are ready to return. We will check the house as soon as possible in the event of a disaster such as typhoon, volcanic eruption etc. Please rely on us for your peace of mind. During your absence we will visit your second home regularly to make sure the inside and outside of building is in the best condition possible. Checking of any dirt and damages inside the house. Ventilating inside of the house. Making sure that the gas etc. are turned off and checking the bulbs and locks. Sending you the check-up report. ※We will check your home in the event of disasters such as volcanic eruption, earthquakes and typhoon. Ventilating the inside of building/each room regularly (from once to four times per month) to prevent any build of mold or mildew. Please consider this service if you are absent during winter season. We will drain water from the taps (weeping) to avoid the freezing of the pipes and also let water out before use. We will control and get rid of pests such as bees’/wasps’ nests and mice etc. We recommend the pre-season building disinfection. We can make an estimate depending on your requests. ※Please also feel free to contact us if you have any pets. ※We can also suggest a regular plan upon your request.